Oooh they're fabulous. So bright and happy! No wonder Miss 3 is pulling funny faces. Wow !!! Great beanies, they are very cool. Gorgeous! Makes me want to have another little baby girl, just so I can accessorise. "Our ability to accessorise is what separates us from the animals" Steel Magnolias...one of my favourite lines ever from a movie. Happy Easter to you and your lovely ones. Meredy xo. Your little babe looks too darling! oh oh oh oh oh oh!!! me please me please can I have one of those cutie little beanies????? oh making any for little boys too??? 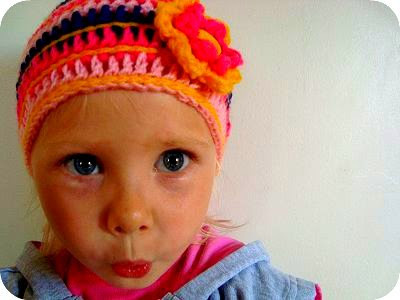 even with the silly face....I oudl just squish those little cheeks! These are so FAB! I LOVE how bright and happy they are! And your little Miss 3 looks adorable!! "Our ability to accessorise is what separates us from the animals" - totally loving that quote!! Cat - I have a rather large list "to make" but once I've got through it we will see what we can do for your lovely head with gorgeous hair!! with a price tag of course...I love to pay for talent!!!! bright, cheerful, I love it! 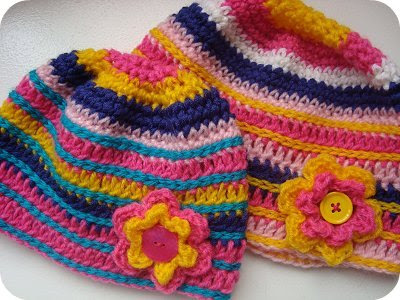 I love the bright,happy colors and the gorgeous flowers on your beanies.. so pretty! i just left a message...gone..
what I was saying is that you are so very talented, knitting, baking, great pics, LOVE it!! Hi Jen - I have done in the past... it really just depends on if I get time. 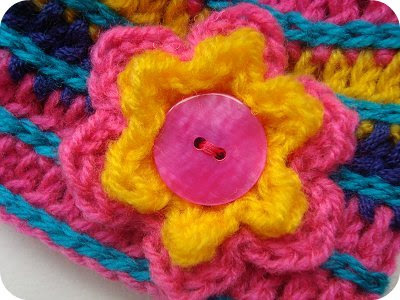 Keep an eye out and as we enter winter I may get the crochet bug to make more! !